This clever tip was posted by Mike Wheeler of Arizona State University's Glassblowing Facility in reponse to a question posted on the ASGS technical mail list. I have discovered a little trick to keeping the connections cool so that viton o-rings, greased standard taper joints, etc. won't overheat. Most of the heat from a furnace tube is transferred to the joints in the form of light. (Have you ever blown into the open end of a quartz test tube and burned your lips? I'm speaking from experience here - it hurts! 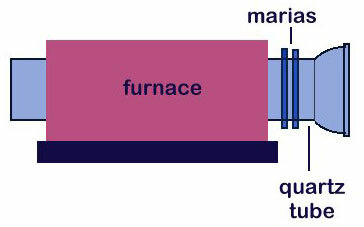 You can eliminate this light pipe transmission of light/heat by adding two to three marias1 between the furnace and the joint connection. The marias scatter the light and keep the connection cool. We use this technique for small quartz ampoules and furnace tubes up to 150 mm diameter. This technique has eliminated the previous need for water cooled metal and glass connectors used in both vertical and horizontal furnace configurations. This remedy seems almost too easy to be true - but try it, it really works. We discovered this technique while working on a system that used a combination of resistance heating and then RF heating samples to 1600 °C. The open end of the 75 mm furnace tube had a custom metal o-ring compression seal that failed most of the time. The light from the furnace traveled down the quartz tube and was collected by the metal compression fitting, destroying the o-ring. Using the marias worked very well to control the heat problem. We have incorporated this into many furnace configurations since that time with similar results. Vertical furnaces with a connection at the top of the furnace pose the greatest challenge. At 1000 °C, the three marias will keep a Chem Thread, greased ground joint, or flat o-ring joint cool. 1 A maria is an external ring of glass formed by heating and pushing the glass tube onto itself. A similar technique is used in steps a-c of our ring seal tutorial.